This customer supplied genuine horn from a big horn sheep and our designers and master blacksmiths created this unique door pull. Custom Cross Buck Style Door - 12th Century Chateau Door, with insulated glass panels, hand hammered iron, and big horn sheep door pull. Handcrafted in heavy iron with a hammer and forge(not a drop forged casted copy). This custom door pull work of art gives this entrance it's own distinct character. As shown - Fine Art Entry Doors in natural outdoor oil finish with light distress. This custom cross buck style entry door features recessed panels and triangle cutout windows with 3/4-inch thick insulated glass and 1 1/2-inch wide moldings. Included in all our custom doors is an adjustable threshold, self closing door sweep that raises and lowers automatically as you open and close the door, roller style door latches, weather stripping, and self closing tension adjustable heavy duty door hinges. The custom entrance door hardware features a hand hammered iron, big horn sheep door pull with an 1/8-inch thick backplate with a heat applied patina finish. Master Blacksmithing Solid Hand Forged Wrought Iron - (no castings or hollow faux metals) by the hand of a genuine master craftsman using age old tried and tested techniques. All Heat Applied Iron Oxide Hand Patina Finished (no powder coating or faux paint on iron finishes). 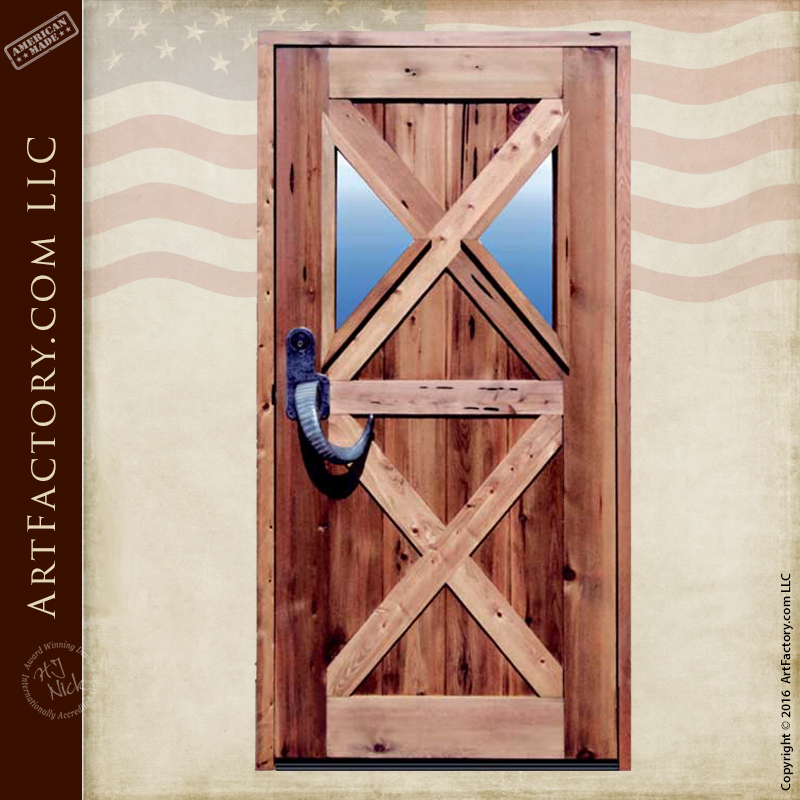 ArtFactory.com is a handmade in America custom door, gate, and furniture manufacturer based in Scottsdale, Arizona. We have been designing and building some of the world's finest furnishings for builders and interior designers with ordinary clients as well as more prominent and successful individuals, C.E.O.s, leaders, royalty and celebrities for more than a century. Most of our clients want a furnishing that has a BIG WOW factor and elegance. They all want investment value and furnishings that makes a proper statement reflecting their personality or the personality of the environment for which it is intended. The Chéteau de Hoch Barr (French: Haut-Barr) is a medieval castle, first built in 1100, above the city of Saverne in the French département of Bas-Rhin. It was built on sandstone rock 460m above the valley of Zorn and the plain of Alsace. Because of this, it has been called the eye of Alsace. On several occasions it was expanded by the bishops of Strasbourg. The Peace of Westphalia mandated the destruction of several castles, including Hohbarr, but after the beginning of the War of the Spanish Succession, in 1701, the fortress was back in use. It was abandoned in about 1770, but the vault continued to be occupied until the French Revolution. Please don't be fooled by our upscale appearance. Our prices are usually lower than lesser quality name brand mass production fast process imports, because "We Are The Factory" creating custom doors hand crafted in America since 1913! ArtFactory.com, a custom wood doors, wrought iron gate, and handmade furniture manufacturer based in Scottsdale, Arizona, and Designs by H.J. Nick, have been designing and building some of the world's finest furnishings all hand crafted in America since 1913. Most of our clients want a furnishing that has a Big WOW factor and timeless elegance. They all want investment value furnishings that make a proper statement reflecting their personality, or the personality of the environment for which the designer custom furnishings are intended. Our craftsmanship ensures your custom wood door and furnishings will stand the test of time, and all handcrafted doors and furnishings are Guaranteed Forever, backed by over a century of fine craftsmanship. Call us to discuss your handcrafted wood doors design ideas 1-800-292-0008. Custom Built Doors - Learn more about our Custom Door Manufacturing process.